Author/s : M. E. Tumbleson 1, Vijay Singh 2, Kent D. Rausch 3, David B. Johnston 4, David F. Kendra 5, Gavin L. Meerdink 6, Wanda M. Haschek 7. How can I control Stored Grain Pests? And avoid the harmful effects. Thanks. In the context of the control of mycotoxins, corn germplasm, specifically referred to the Bt transgenics, can not be ignored, since it is assumed that they will determine to a great extent the degree of injury to fungi and their mycotoxins. I have shown that Bt maize is vulnerable to the attack of Diabrotica virgifera virgifera (maize rootworm), which was considered "unlikely". This attack, for its notoriety, is important in the United States, and also in other countries of our hemisphere. We are currently aware of a new case of resistance in South Africa, Busseola fusca (maize moth), one of the most aggressive pests affecting maize in that nation, as it has apparently developed a rare defense mechanism against the action of Bt toxin. Today the resistance of insects to transgenic maize is inherited as a dominant and non-recessive trait, thus manifesting the insect, a new mechanism of evolutionary defense, for the adaptation to its habitat. I remark the aforementioned, because it is unquestionable that the vulnerability of Bt maize, in the face of these pests, makes it easier for an aggressive attack of mycotic agents, especially those that produce aflatoxins, on which curiously no research papers with scientific rigor have been reported, regarding Bt maize. Which is controversial and lends itself to suspicious interpretations. Good afternoon and you are all invited to visit Peru. 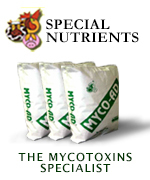 Would you like to discuss about this topic: Mycotoxin Control during Grain Processing?